Light, space and movement are at the center of the artistic work of Dieter Jung, born in 1941, who has been dealing with the visual effects of color and light, surface and space since the mid-1960s. 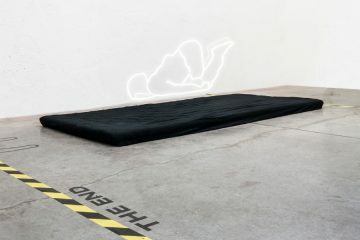 In order to make the cursory moment of optical phenomena visible, Dieter Jung uses both analog and digital techniques. Painting, drawing, printmaking and holography are in constant dialogue in his work. With the exhibition Dieter Jung. 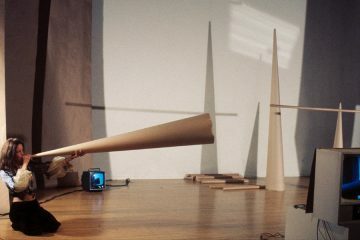 Between and Beyond, the ZKM honors the extensive work of the Berlin-based artist, who has been closely associated with the ZKM since its foundation. 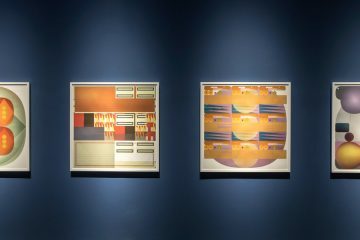 In addition to holograms, holographic mobiles and holographic light spaces, the exhibition includes the artist’s paintings, drawings and prints. Due to the rapid development of digital technologies, holography has once again become the focus of attention. Currently, researchers are working on the development of holographic displays with which our way of working, learning and interacting will change fundamentally. Especially the latest developments in photonics, in which individual light particles become information carriers, revolutionize the technical requirements of holography to an unprecedented extent. In the near future, holographs may be projected freely in space as three-dimensional mixed reality applications, thus cutting off the binding of the holographic representation to its carrier materials. By floating the image in space, the ideas of Dieter Jung and other pioneers of holography, on which they have been working with their works since the 1960s and 1970s, would ultimately be fulfilled. The aim of the exhibition and of the curator Philipp Ziegler is to highlight the structural connections and interdependencies between the various strands of Dieter Jung’s work and to show the artist’s holographs and holographic mobiles in close exchange with his paintings and drawings. Against the background of current technological developments and increased interest in holographic techniques, the significance of his work for media history will thus be reassessed. 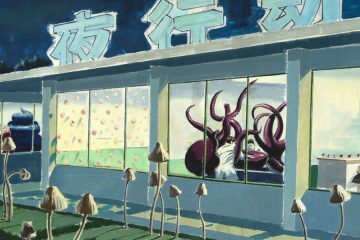 Jung’s interest in the process of visual perception, the dual quality of light as particles and waves and the technical structure of images has accompanied him since his studies at the Hochschule für Bildende Künste [Academy of Arts] in Berlin. Already in his first paintings he dealt with the representation of light and reflections. At the beginning of the 1970s, he painted a series of heads of well-known and unknown persons reminding of interference structures, in which the faces of Sigmund Freud, Ezra Pound and Friedrich Nietzsche are embedded in horizontally and vertically intertwining lines of oscillation, which, for Jung, initially made reference primarily to the textures of weaving art and the principle of warp and weft in the tapestries of the Renaissance. After studying holography at the New York School of Holography, Jung worked with leading scientists to develop a work that expanded the technical and artistic possibilities of holography, which the physicist Dennis Gabor discovered rather by chance in 1948, and made him one of the leading protagonists of holographic art internationally. For his first holograms Jung uses feathers found in 1977 in Central Park in New York, which float in space and cast their shadows as filigree objects in the holographic image. Subsequently he transferred the poems of Hans Magnus Enzensbergerinto the medium of holography, for which elaborate models had to be built in order to film them on a 360° turntable. 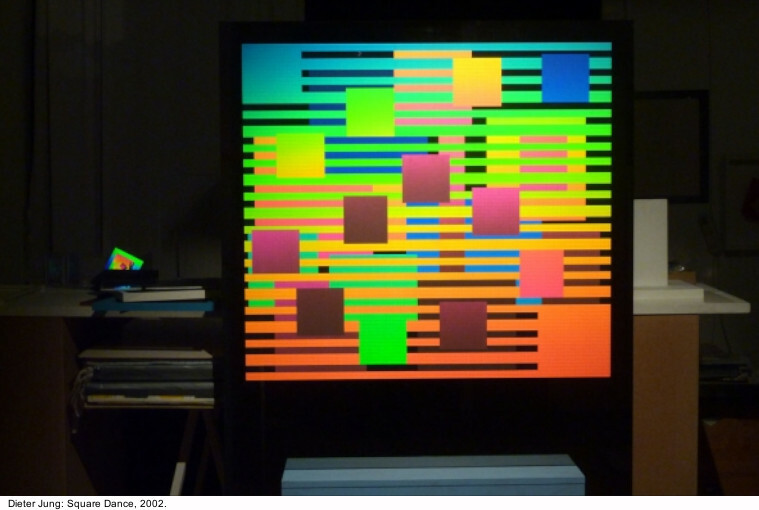 In the series Into the Rainbow, Gegenwartsräume [Present spaces] and Inbetween Dieter Jung creates abstract color spaces in the early 1980s using the holographic one-step technique discovered by Stephen A. Benton, in which the pure colors of the rainbow float freely in space. From 1985 to 1988 as a Research Fellow at the Center for Advanced Visual Studies (CVAS) at MIT in Cambridge, MA, directed by Otto Piene, Dieter Jung had extensive technical possibilities at his disposal with which he could explore new holographic methods for the replacement of the holographic image from its inherent object. In close exchange with scientists, the first computer-generated motion holograms are created there, in which enormous amounts of data were mastered for the time. 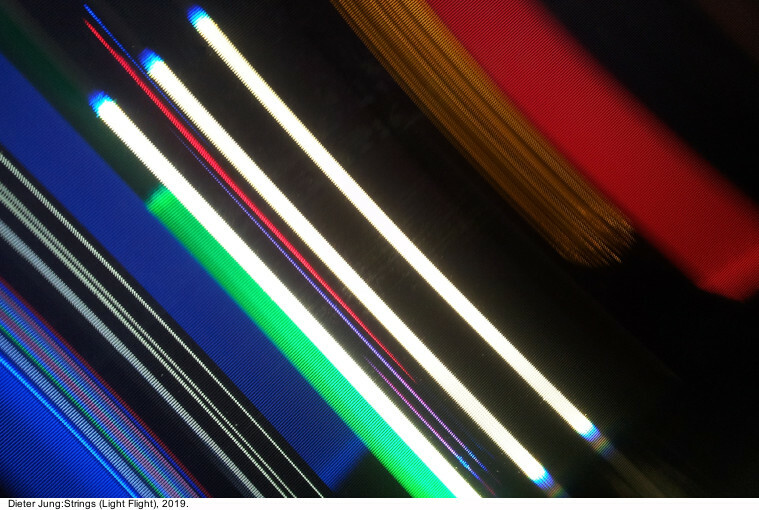 In the Light Mill (Motion in Space – Space in Motion) series, diaphanous, mutually penetrating color surfaces rotate around three axes at different speeds. 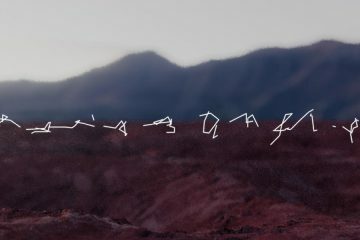 By moving in front of the hologram, the viewer activates the free-floating image sequences in space and is thus actively involved in the creation of the work. 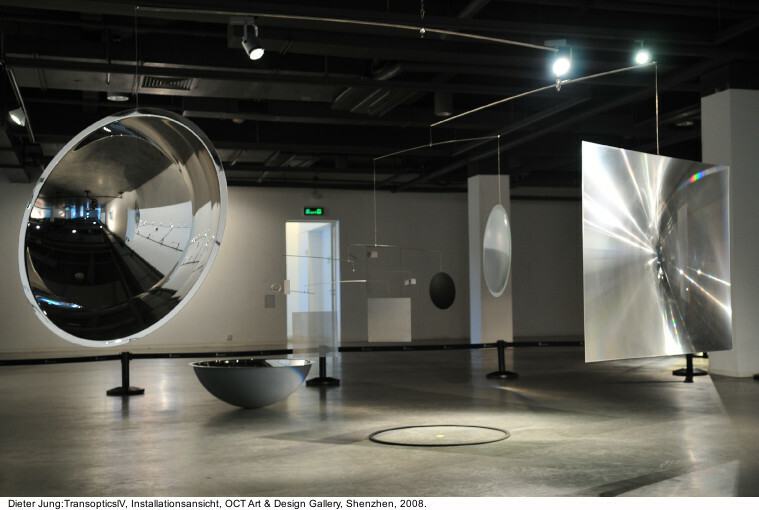 In his most recent light spaces and holographic mobiles Jung transfers the play with optical phenomena of light by means of lenses and mirrors into real space, which is thereby called into question for the viewer in his physical conditions. Dieter Jung was born in Bad Wildungen, Germany in 1941. He studied Theology from 1962–1963, then trained to be an art teacher from 1962– 1964. Until 1967 he studied Painting and Graphics at the Hochschule für Bildende Künste [Academy of Arts] in Berlin under Hann Trier. From 1971– 1974 he studied at the German Film and Television Academy in Berlin and realized documentary- and animation films. In 1975 Jung received his first guest professorship at the Universidade Federal da Bahia in Salvador, Brazil, before studying Holography with Dan Schweitzer and Sam Moore at the New York School of Holography in 1977. 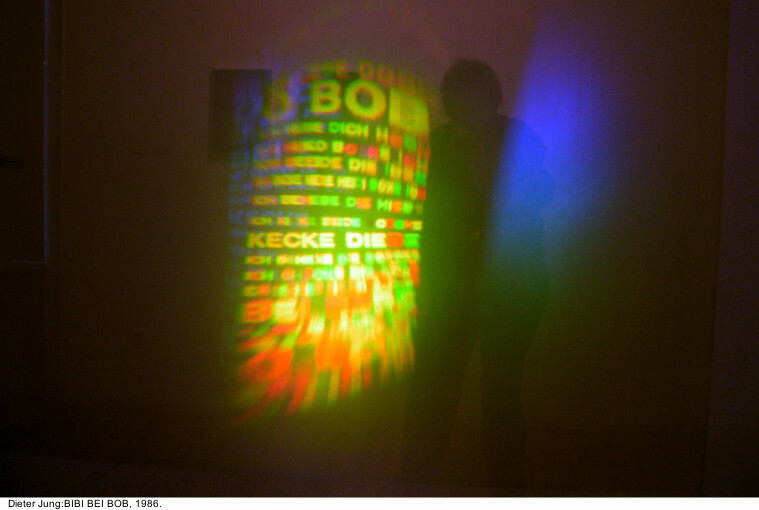 From 1985 to 1989, Dieter Jung was a Research Fellow at the Center for Advanced Visual Studies (CAVS) at MIT in Cambridge, MA; from 1990 to 2007, he held a professorship in Holography and Light Art at the Academy of Media Arts Cologne. 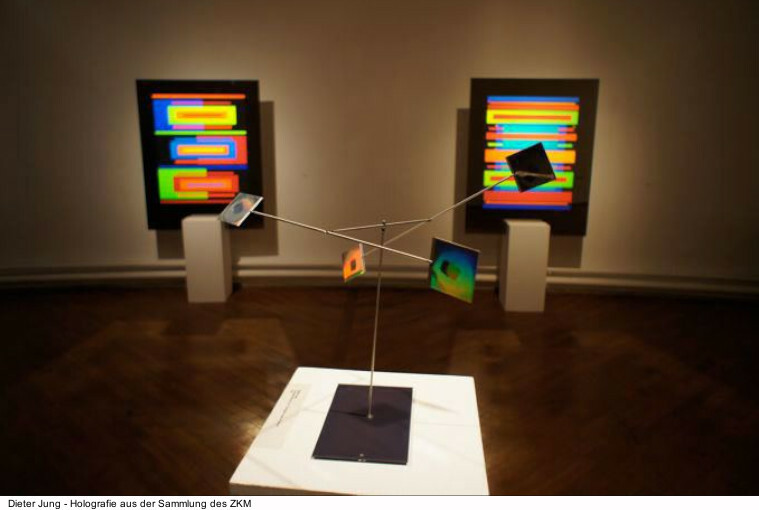 From 1992–1996 he was a member of the Board of Trustees of the ZKM | Center for Art and Media Karlsruhe. He was as well a member of the MIT Advisory Council on Art-Science-Technology in Cambridge, MA. Since 2011 he has been a member of the György Kepes Society in Hungary. His work has been shown in numerous solo and group exhibitions worldwide, including the 2008 exhibition Visible – Unvisible at Today Art Museum in Beijing, China and Flying Colors – Moments of Seeing at OCT Art & Design Gallery in Shenzhen, China. Dieter Jung lives and works in Berlin.